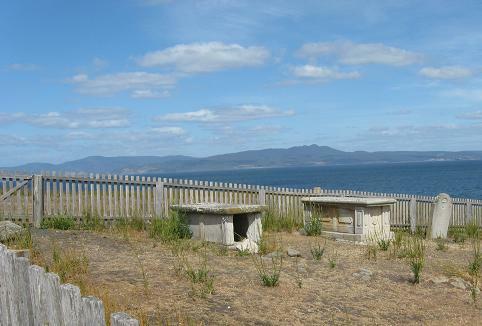 On Maria Island you will see evidence of a layered history. Maria Island was sounding better and better. The entire island was a National Park. Great! We love nature. The ferry ride took 40 minutes, and left only once or twice daily. Great! We love getting away from it all. There are no shops on the island so you need to bring your own food and drink. Great! We wouldn't be looking for lunch so we could spend all our time exploring. Even in 1968 Maria Island was viewed as a safe haven for animals under threat. 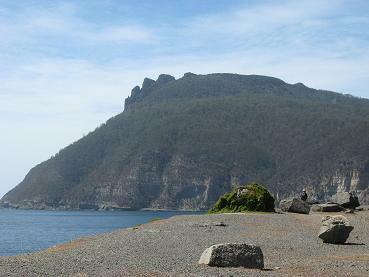 Cape Barren geese and Forester kangaroos were imported to the island back then, and can still be seen there today. The island has been used for many other purposes. These include a convict settlement, a cement company and a whaler's station. Happily it is now a preserved National Park, so the beauty of the island is protected and can be enjoyed by one and all. 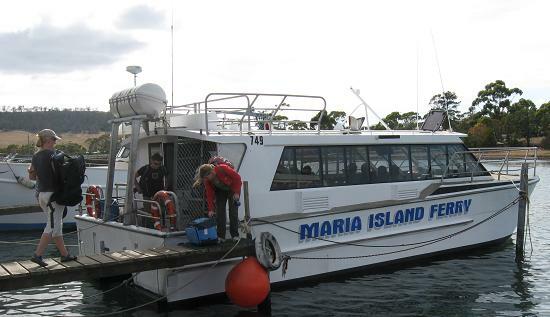 The Maria Island ferry leaves from Triabunna (on Tasmania's east coast). During the ride, John our skipper filled us in on the history of the island and the surrounding area. Also on board was a Parks and Wildlife officer, who told us about guided walks that we could join later in the day. The first place you should visit is the Visitor Centre. 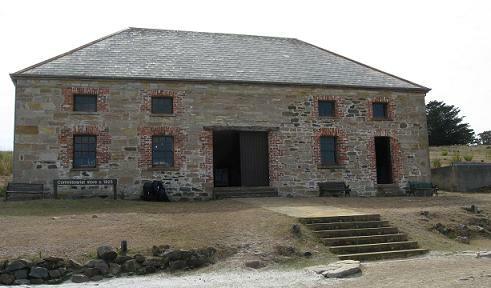 This is located in the former Commissariat Store, the oldest building on the island. There you will find information on all the island's attractions, including walks. As we were only going to be there for the day, we opted for a couple of short ones - the Painted Cliffs walk and the Fossil Cliffs walk (each around 2 hours long). 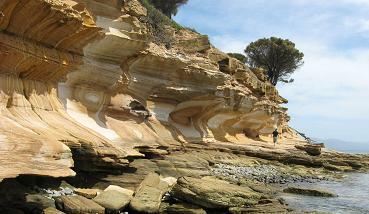 A guided walk to the Painted Cliffs was scheduled for later in the day. That being the case, we decided to do the Fossil Cliffs walk, visit the Darlington town ruins, then join the Painted Cliffs guided tour. Greg and I are bird lovers so we were looking forward to seeing Cape Barren geese. We didn't have to wait too long before coming across plenty of these fine creatures. They were quite tame and seemed comfortable with us doing a little close examination and photo-taking. On the way to the Fossil Cliffs, we passed a cemetery. The graves date from 1825 to 1942, spanning a range of eras in the history of the island. When you arrive at the Fossil Cliffs, you don't know what to look at first. There are so many terrific views - the Bishop and Clerk peaks, the sea and all its attractions, and of course the Fossil cliffs themselves. The cliffs are actually made up of limestone, studded with thousands of mussel-like shells. The soft parts of the creatures have rotted away, leaving only the hard shells, which have lasted almost 300 million years. Simply amazing! 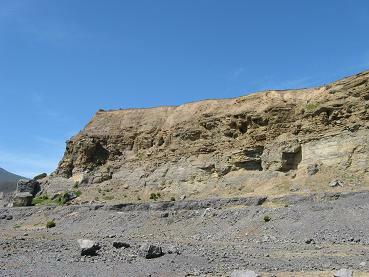 It was from these cliffs that limestone was quarried for the cement works in bygone days. The Bishop and Clerk peaks looked tempting but we kept to our plan and headed for Darlington. Later we discovered that the walk to Bishop and Clerk is almost continuously uphill! Were we glad we stopped ourselves! 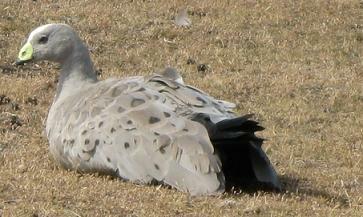 At Darlington we saw more Cape Barren geese as well as Tasmanian hens. 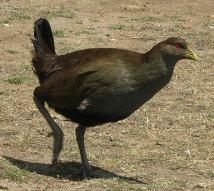 Unlike the Cape Barren geese, the Tasmanian hens seemed a little nervous. They were always ready to run away on their skinny little legs! We strolled around the buildings at the Darlington courtyard. I could see the Coffee Palace on the left and the Penitentiary on the right. I thought about the very different purposes for which these two buildings were constructed. 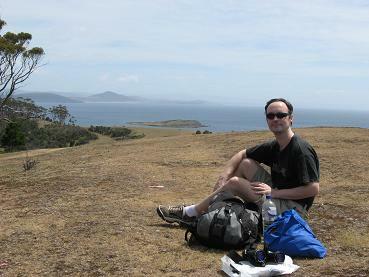 What a marvelous layered history Maria Island has! As expected, we learnt heaps on the Painted Cliffs guided walk - more than if we'd done it on our own. The walk had been timed to coincide with low tide. 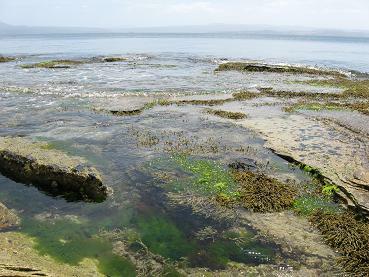 This is the best time to view the colourful marine life present in the rockpools nearby. Our guide showed us astonishing creatures like waratah anemones and Neptunes necklace. What fascinating names! What about the Painted Cliffs themselves? The beautiful patterns have been caused by ground water streaming through the sandstone. This action has left traces of iron oxide which have stained the rock, resulting in the gorgeous colours. Next to the Painted Cliffs is the Hopground beach. We watched in admiration as a couple ran in for what must have been a rather cold swim.